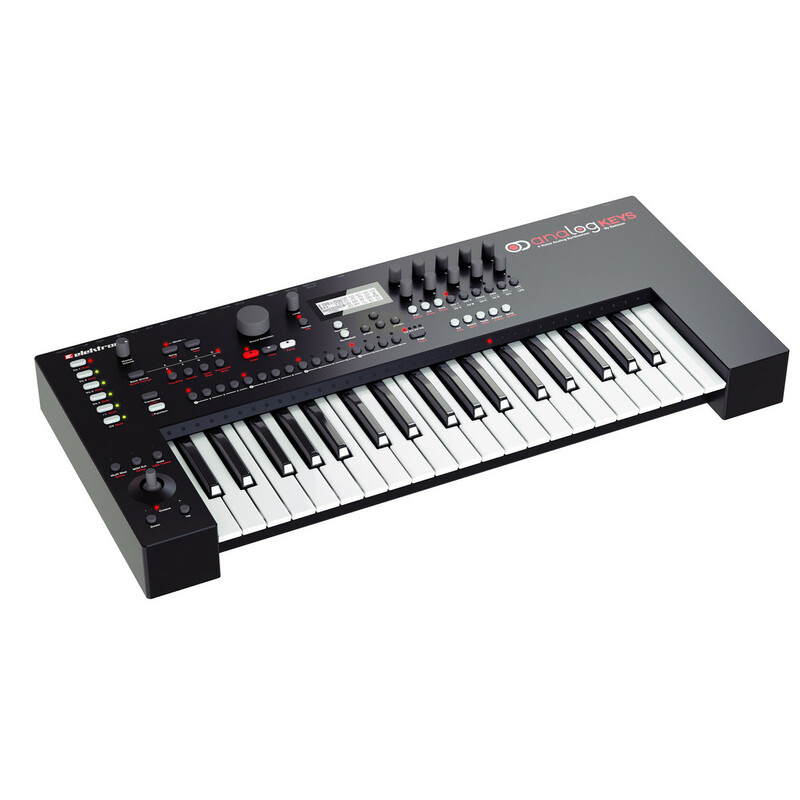 The Elektron Analog Keys 4 Voice Analog Synthesizer is primed to be an amazing live performance keyboard as well as being perfect for creating huge analog synth sounds in your studio. 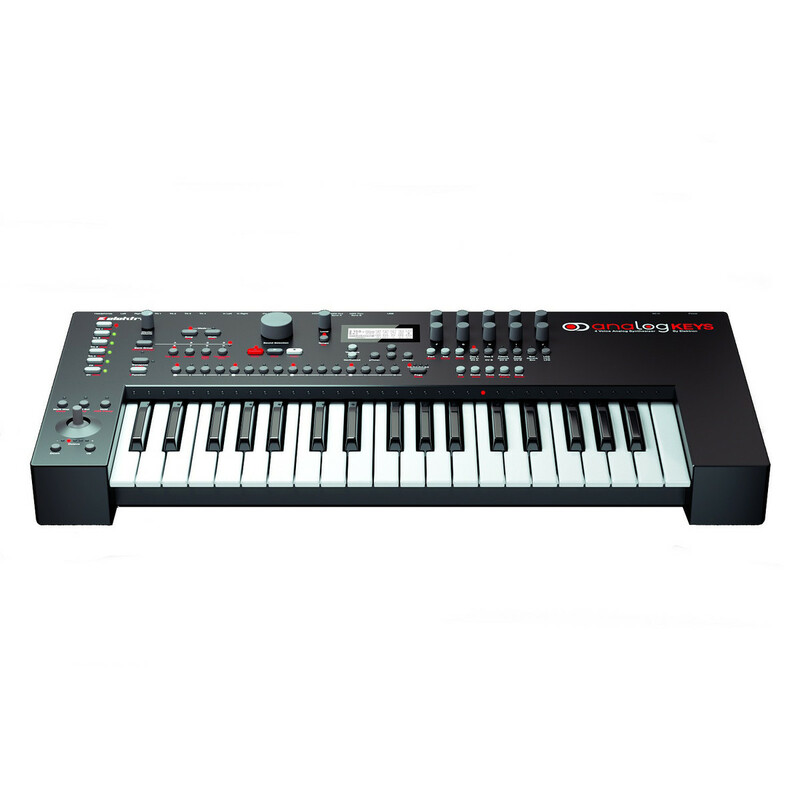 A flagship in analog synthesis, with digital controls and unprecedented playability, the Analog Keys four-voice polyphonic instrument is ideal for the expressive modern musician. 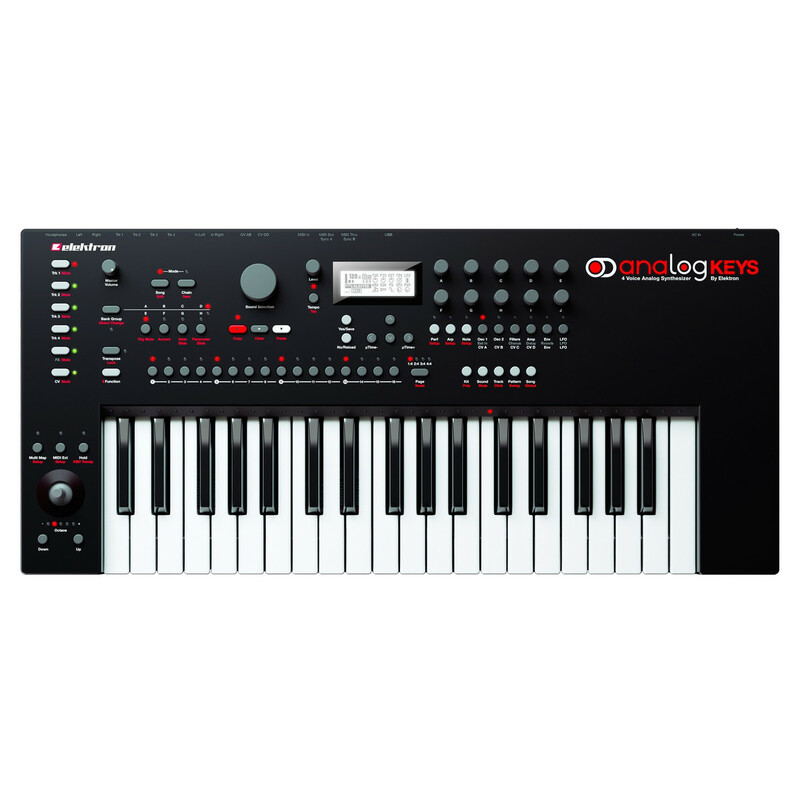 Analog keys is capable of delivering the finest basslines, chords, leads and sounds imaginable. The warm, deep tone represents the pinnacle of analog synthesis, with the acclaimed Elektron sequencer ready to arrange and warp the analog sounds in real time. Incredibly well crafted master effects complete the experience, where a new world of sounds awaits you. Optimised for performance, Analog Keys is tailor-made for the stage. With a 37-note, semi-weighted keyboard, you have instant control of the analog tones. There's a special performance mode offering direct access to parameters defined by you, and a joystick which can control up to 15 parameters. Morph and shape your sounds, improvising when playing live has never been easier. Analog Keys integrates with other instruments with no fuss. Simply press a button to transform Analog Keys into a MIDI keyboard, ready for controlling external MIDI gear. There's a dedicated CV sequencer, CV/Gate and DIN sync outputs, allowing you to play, sequence and control vintage and modern analog instruments with precision. Made to be played, voice allocation is fully customisable. Use as a polyphonic four voice synth, four seperate monophonic synthesizers, in four note unison mode with defined pitch spread or anything inbetween! Features like Dual Filter Force cover all bases. The 4-pole lowpass ladder filter and 2-pole multi-mode filter shape sounds along with a fully analog overdrive circuit. Saturation ranges from gentle and warming to total destruction. The effects section of the Analog Keys has been constructed from the ground up, a perfect match for the strong analog tones. Use the Wideshift Chorus, Saturator Delay and Supervoid Reverb to situate sounds in acid cathedrals, deep abysses and head-spinning rotating rooms, or add that subtle finishing touch. Extensive modulation possibilities are at your fingertips. Each of Analog Keys' four voices offers two assignable LFOs and envelopes, AM cross-modulation, oscillator sync and dedicated LFOs for both pulse width modulation and vibrato. Thousand of patterns and kits can be stored and recalled with ease. Over 4000 sounds can be recalled instantly from the +Drive Sound Library whenever you need them. There are individual stereo outputs for each voice, plus a main output. The two audio inputs allow for radical analog filtering and FX treatments of external sounds. Overbridge integrates Hardware and software like never before. The versatile integration software bridges the gap between your Elektron analog hardware and your music studio software through a single USB connection. This version is primarily compatible with Ableton Live, but work is in progress for other popular hosts. Enjoy, experiment and explore your sound manipulating capabilities with this new crossover technology. To download Overbridge for Ableton please use the link here. Full VST/AU control - Thanks to Overbridge, the Analog range of Elektron machines can be deeply integrated with PC and Mac computers. The customized and machine specific software plugins, available in VST and AU formats, give direct parameter access over USB and allows efficient DAW based sound editing and sequencing. Overbridge merges the functionality of software plug-ins with the unmatched sound of analog hardware. Bi-directional USB audio streaming - Overbridge makes multi tracking easy. Connect a USB cable and record multiple Elektron machine voices to separate DAW tracks in 24 bit quality. Or send audio from a DAW, process it with the analog circuitry of the Elektron machines and bring back the results to a new DAW track all over a single USB cable and without timing issues. Overbridge even allows the Analog range of machines to be used as multi-channel USB sound cards. Total recall - Management of analog sounds and sequences has never been easier. Any adjustments made either directly on the Elektron hardware or via the software plug-in can be automatically recalled when loading a DAW project. Overbridge offers ultimate convenience when handling Elektron machine data. Recommended power cable type: IEC 60320 C7, rated for 240V and at least 2.5 A.